Sony's pocket-sized powerhouse shoots top-end oversampled 4K video, 24-megapixel stills and has an 11fps burst mode! 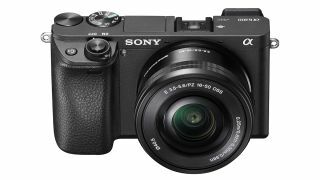 The A6300 has a slim, rectangular rangefinder-style body that packs in a terrific 24-megapixel APS-C sensor and enough processing power for 4K UHD video, downsampled from 20MP capture for the best possible quality. The A6300 also packs in 425 phase-detection AF points and 11fps continuous shooting. This deal includes Sony's super-slim 16-50mm power-zoom kit lens, but you can of course fit any Sony E-mount lens.